For proven relief of red mange, ringworm, cuts, scrapes, and much more on dogs, cattle, and horses. This product has been tested and used for over forty-five years. Provides effective relief of red mange on dogs, screwworm, and ringworm. Eliminates certain types of growths on animals. Miraculous results on most skin disorders on animals. FOR MANGE AND CUTS ON DOGS: Cleanse area to be treated, let dry, apply to all affected areas and rub into skin. Repeat every 3 days until desired results. On dogs over 10 years old, use only every 2 weeks. FOR USE ON CATTLE: After dehorning and castrating. 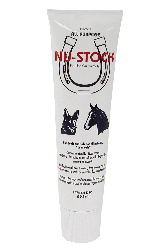 FOR USE ON HORSES: Use for cuts, burns, bruises, swelling, soreness, loss of hair, tender hooves, etc. Prevents proud flesh, very effective for rain rot, mud poisoning, dew poisoning.